Mark Hamill wants to get the "whole gang" of original actors to appear in the new 'Star Wars' film. The star and many of the cast from the first film in the iconic series - 'Star Wars Episode IV: A New Hope', released in 1977 - have been approached to appear in the seventh instalment, and he hopes to get them all on board. Mark told US TV show Entertainment Tonight: "I said to George [Lucas, Star Wars creator] I wanted to go back to the way it was. "And another thing I'd want to make sure of is, are we going to have the whole gang back? Is Carrie [Fisher] and Harrison [Ford] and Billy Dee [Williams] and Tony Daniels, everybody that's around from the original returning? "I want to make sure that everybody's on board here, rather than just one." 'Star Wars' was filmed as episodes IV, V and VI between 1977 and 1983, then a trilogy of prequels were made between 1999 and 2005. Harrison Ford has reportedly already signed up to reprise his role of Hans Solo. 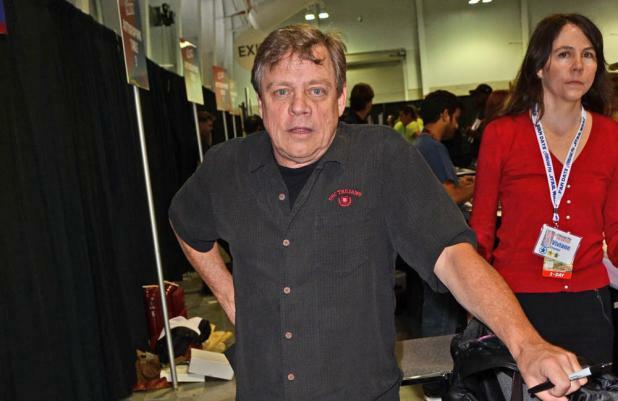 Mark - who played the lead role of Luke Skywalker in the original trilogy - added he hadn't signed a contract to appear in the new film, to be directed by J.J. Abrams, but is set to have a meeting with its writers. He said: "They're talking to us. George wanted to know whether we'd be interested. He did say that if we didn't want to do it, they wouldn't cast another actor in our parts - they would write us out. "I can tell you right away that we haven't signed any contracts. We're in the stage where they want us to go in and meet with Michael Arndt, who is the writer, and Kathleen Kennedy, who is going to run Lucasfilm. "Both have had meetings set that were postponed - on their end, not mine. They're more busy than I am." 'Star Wars 7' is expected to be released in 2015.